At least four people have been killed and 30 injured in a militant attack on a court and prison complex in the Pakistani city of Peshawar, police say. One attacker was shot dead by police. The other blew himself up in a crowded courtroom, injuring a woman judge. It is unclear if the target was the court or the jail next door. There was no immediate claim of responsibility. 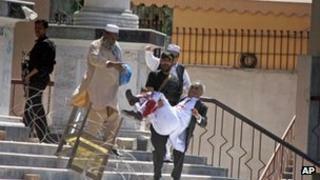 Peshawar has come under frequent attack by the Taliban and other militant groups in recent years. A local official said the attack could have been an attempt to cause disruption before parliamentary elections, due to be held in May. In 2009 at least 19 people were killed when militants launched a suicide attack on the same court in Khyber Road in Peshawar, which borders Pakistan's volatile tribal areas where many militants are based. Last April almost 400 prisoners escaped from a prison in the north-west town of Bannu after it was attacked by militants. Media captionThe BBC's Orla Guerin: "Suspicion will naturally fall on the Taliban"
In the latest raid the attackers struck in broad daylight, in what officials suspect may have been an attempt to free fellow militants being held in the Peshawar complex. Local residents heard loud explosions and intense gunfire. Television footage showed people running for cover, some of them wounded. For several hours it was reported there may have been other attackers, possibly with hostages. But then police said the courts had been secured for daily business and the situation was under control. Witnesses present at two of the busiest courtrooms recount that there was firing, followed by an explosion nearby that shattered the doors and windows of the building. Many people were injured. "I was sitting with a friend in one of the courts when we heard firing followed by a blast," one man told Reuters news agency. "When we came out, there were dead bodies and injured people all over the place." Khyber Pakhtunkhwa's information minister Mian Iftikhar Hussain told media that "this may be an attempt to disrupt the coming elections". It is not clear how the bombers entered the high-security zone. The complex is located close to the residence of the army's Peshawar Corps Commander, the city's main prison and its sole five-star hotel, the Pearl Continental.